The CAWC (Man-Lock) is a mandatory five-days training course for individuals who are assigned to work in compressed air (CA) environment. It covers the WSH Act and subsidiary legislation applicable to compressed air works; compressed air illness (decompression illnesses and Dysbaric Osteonecrosis) and Barotrauma; hyperbaric physics; chamber operations; control measures for CAW and oxygen first aid procedures. State the WSH Act and subsidiary legislation governing compressed air works (CAW). List the roles and responsibilities of a Man-Lock Attendant and assess the suitability of workers to enter the compressed air (CA) environment. Describe the symptoms of compressed air illness and barotraumas. Calculate air pressure for CAW. Carry out compression of personnel before entering into CA environment. Identify fire hazards and use the fire extinguishers in tunneling and CAW. Carry out decompression of personnel who are leaving CA environment. Maintain a lock attendant register including health declaration form for all compressed air workers and report all workers with symptoms of Decompression Illnesses (DCI) and barotraumas. Assist in the administration of oxygen first aid. A mandatory training course for individuals who are assigned as Man-Lock Attendants at construction worksites or any place that requires personnel to work in a compressed air (CA) environment. No person shall be employed as a man-lock attendant in a worksite where work in a compressed air environment is carried out unless he has received adequate training to familiarize him with the hazards associated with compression, decompression and compressed air illness and with the keeping of records under these regulations. Workplace literacy and Numeracy Level 5 or equivalent. Must be certified medically fit; should have normal colour vision; trained in first aid and posses knowledge of diving, compressed air work, hyperbaric environments or hyperbaric medicine and fire-fighting. Learners must be certified medically fit to enter compressed air environment by a designated factory doctor (DFD). The course is assessed by a written test and a 4-hours practical assessment. 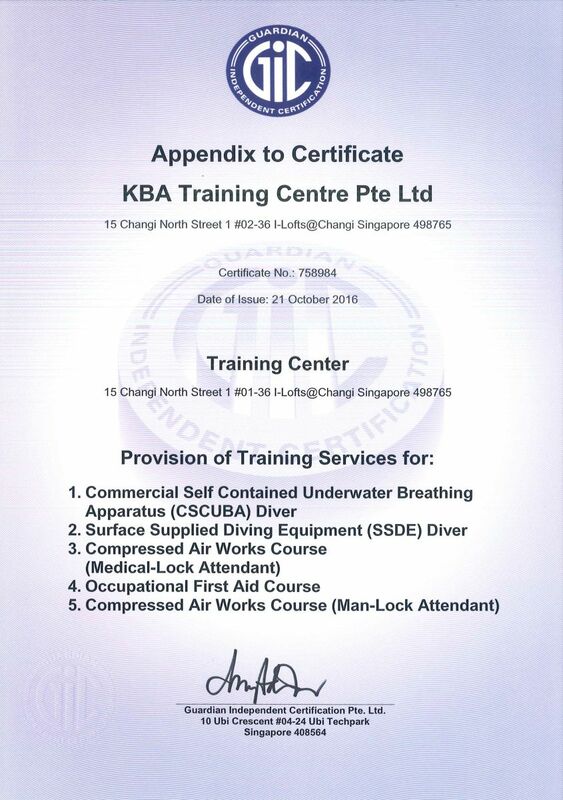 Course participants with 100% attendance and successfully completed / passed both the practical and written assessments, will be awarded the Compressed Air Works Course (Man-Lock Attendant) certificate issued by KBA Training Centre Pte Ltd ~ Course accredited under ISO 29990:2010 Standard.